Very insightful post. Thanks much for sharing. Great post! 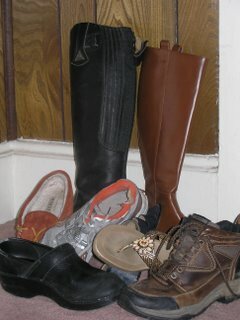 We women wear many hats (and shoes! ), and your entry just serves to remind us how versatile we really are. I like your strategy of employment hedging. It's both evolved and intelligent. If one part-time job falls through, you can adjust the hours of your other jobs to compensate, or find another part-time gig to fill the gap. Losing any one job doesn't spell disaster for you, which is a great advantage in the current economy. Thanks for your comments. It's funny... when the economy was better, I always felt bad for not having a full time job (like I was the typical person you'd ask "When are you going to get a real job?"). But now that people are losing "real jobs" left and right, I know that my "employment hedging" as you call it has some advantages. Although there's no such thing as a recession-proof career, some jobs may offer more job security than others! The U.S. Bureau of Labor Statistics estimates that by 2016, three out of 10 jobs in this country will be in education and in health care. My friend once said that if you want or need a new career, be a registered nurse. With a decent degree and some career training, you may be well on your way to enjoying peace of mind and job stability, even in this freakin, twisted economy! Nurses can make an annual salary between $40,000 to $60,000! Wow. A registered nurse can make more than 60K. 60K is the median salary right now. Demand for nurses is hot and is only getting hotter. All good advice. Money is not always worth the stress to get it and even though one might be jealous of some high paying job, it's not always the glamourous life it seems like. Why do you think many CEO's are always drinking or whatever? A part time job can be a good bridge to a full time job as well. Sometimes people realize that one is doing such a great job they get hired for a regular spot. I've gotten a couple long term jobs, from a single freelance project. In today's economy, it is very hard to find a stable and well-paying job. The recession has greatly affected companies and many people are suffering from debt concerns because of high interest rates. We should all be taught on how to spend right and how to save money. Invest also on the right education and training and eventually you will end up getting a hard-earned stable job.